This adult hopper was photographed on Velvet Mesquite (Prosopis velutina) along French Creek, Bradshaw Mts., Arizona, May 24, 2009. 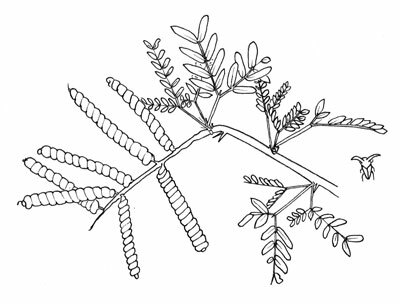 Screwbean Mesquite, Prosopis pubescens. The double-thorned hopper is illustrated at far right. Membracidae, or Tree Hoppers, are common insects on many kinds of plants, particularly woody plants. In many cases the pronotum is shaped as a thorn or other disguise. In the case of Platycentrus the thorn disguise is functional, i.e. the projections are sharp. Thus the insect is camouflaged, and if that fails the potential predator encounters a sharp spine. Escape can also be employed: the hind legs are capable launching the bug quickly and then the wings take over in flight. Treehoppers are flying, armored vehicles! These are true bugs (Homoptera) and as such possess piercing-sucking mouthparts that are used to tap phloem sap inside the stem. Their feeding can cause injury to growing stems. 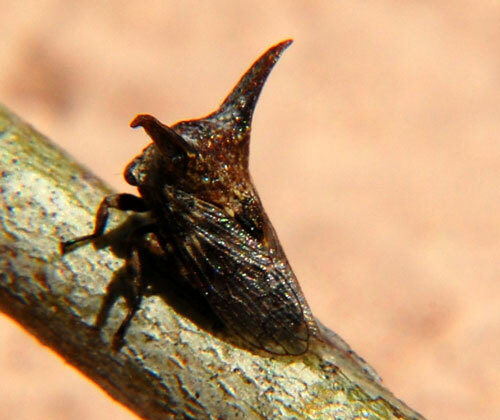 Like other plant-sucking bugs, tree hoppers release sugary liquid as a waste product that may attract tending ants. The eggs are inserted into fresh growth by the female with a sharp ovipositor. Adults can fly, but nymphs (immatures) cannot. Platycentrus acuticornis is a common species in the Sonoran Desert where it occurs on mesquite species.